At Freedom Gymnastics we offer a variety of classes that introduce new students to gymnastics skills and build on those skills to learn more advance moves and techniques.﻿﻿﻿﻿﻿﻿﻿﻿﻿﻿ If your child would like to progress beyond recreational classes, we have a Pre-Team/Developmental Team and USAG competitive teams for levels 2 - 10 and USAG XCEL competive teams for levels Bronze - Diamond. Private lessons are also available. Please contact the gym for more information. Gymnasts who are on Pre-Team will be introduced to the basic exercises, skills, and conditioning needed in order to advance to team. The main focus in practice is strength and flexibility training to achieve proper technique, and development of gymnastics skills. It also allows the gymnasts to get used to the time commitment of the sport. The main goal for gymnasts on pre-team is for them to eventually become part of one of the competitive gymnastics teams. Pre-Team practices twice a week for 2 hour long sessions. 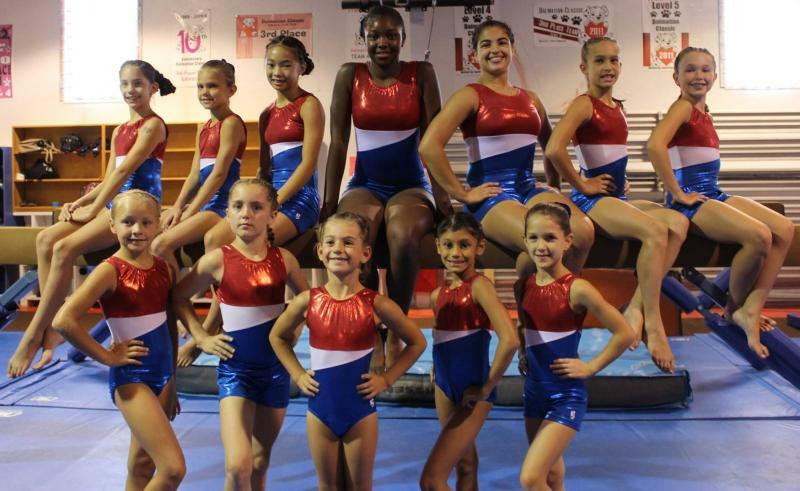 Freedom Gymnastics has a USAG girls’ team. Depending on which level they join, gymnasts are expected to train between 6 and 14 hours per week. Team members develop strength, flexibility and skills, and learn to perform routines consistent with the level that they compete. • Who can try out? Girls ages 4 and up can try out for team and pre-team. Prior gymnastics experience is not necessary, but is recommended. You do not have to be a current member of Freedom Gymnastics to try out. • Is there a cost to try out? There is no cost to try out, but if you are invited to join the team please keep in mind that even though our prices are quite reasonable, being on any gymnastics team can be costly. Also it is time consuming, especially for the more advanced levels. • What skills are needed to make pre-team? o Flexibility: minimum 145 degree split (left, right and straddle), and a bridge from a push up position. o Strength: 5 push-ups, 3 pull-ups or chin ups, 10 crunches, 3 – 5 leg lifts. Floor: forward roll, backward roll, cartwheel, and handstand against the wall. • What skills are needed to make Team? Skills qualifications vary with the level that gymnasts compete. All of the above must be demonstrated plus additional gymnastics skills. • What are other things to keep in mind? o Please make sure you pre-register to reserve your spot. o Please arrive in time to register and warm up with the group. o A waiver signed by the child’s parent of guardian is required to participate. o Please keep in mind that just because your child tried out does not mean they will be accepted onto the team. If this happens, we will notify you with a suggested recreational class for your child to participate in. o If your child does make the team, you will be notified on which team and level they will be put onto. o All of our teams are competitive except our Pre-Teams. These teams are for our youngest gymnasts ages 4 and up . The Pre-Teams are designed to prepare for competition teams. o Please bring plenty to drink, also drinks sold at the gym for $1 (Gatorade and water). We hope to see you and your gymnast at try-outs, and good luck to everyone who participates.